In November 2018 I headed to the south of Japan for a tour to Miyazaki, Supported by Tokyo Metropolitan Government. 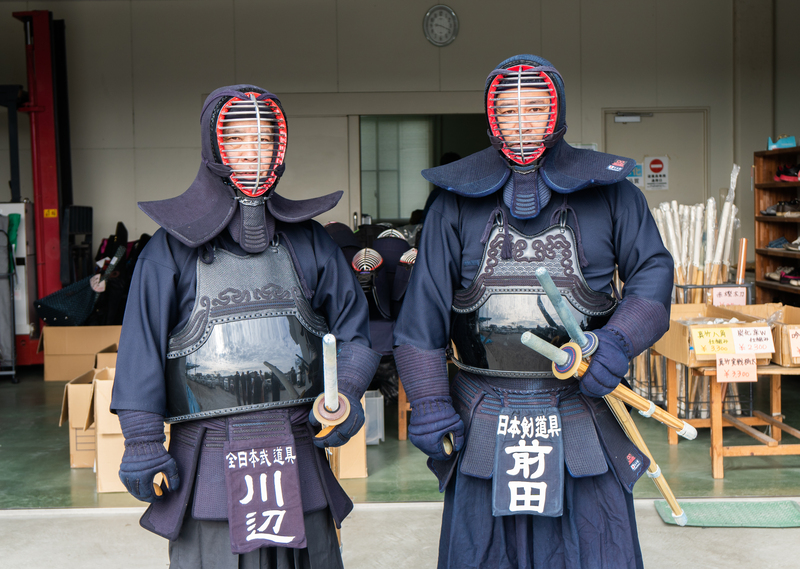 The trip was a chance to experience a little known town to see what some of Japan’s little known areas have to offer. 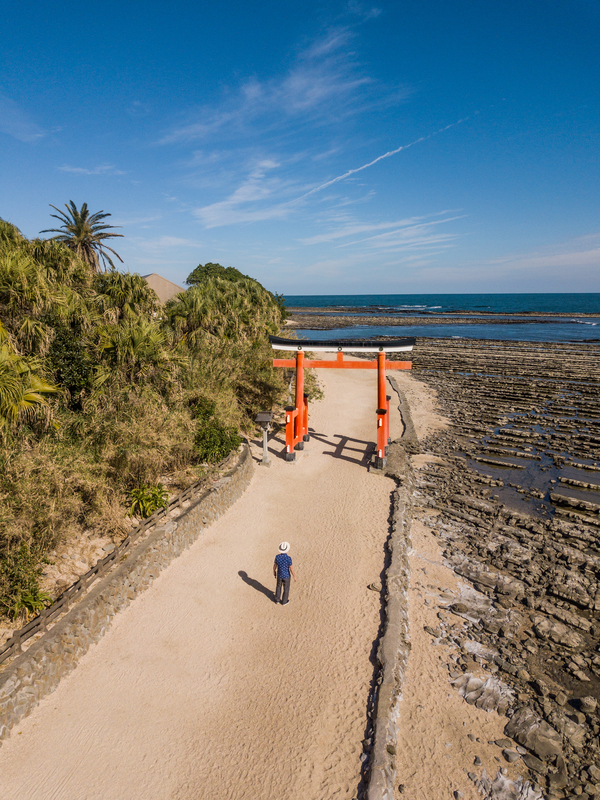 The tour included a mixture of highly-localized and specialist activities, combined with a short trip to the lovely little island of Aoshima. 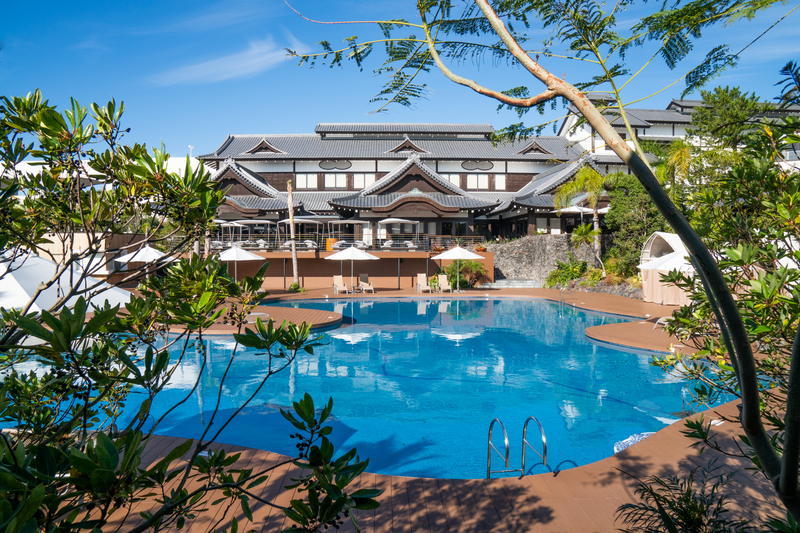 It also included a home stay and a hotel stay at the luxurious Phoenix Seagaia Resort. The trip began with some drinking in the early morning… tasting shochu at the brand new Kirishima Factory Garden where we were amongst the first to see the facilities. The production was a huge enterprise and everything in the complex spotless as potatoes are processed and blended in to one of Japan’s famous alcohols. The museum inside the factory explained in great detail how shochu is made detailing each step of the process right next to and usually above the actual factory itself. There was an opportunity to taste different shochu at the end of the tour too, which was a natural highlight, though the Shochu ice-cream on what was a hot sunny day was most appreciated. Our next stop took us further in to the countryside, to the site of Saitobaru. Here we first watched as locals used their small plough to bring our potatoes from the field. They ran the machine to show us how it works and then invited us to get on board and help out selecting potatoes. 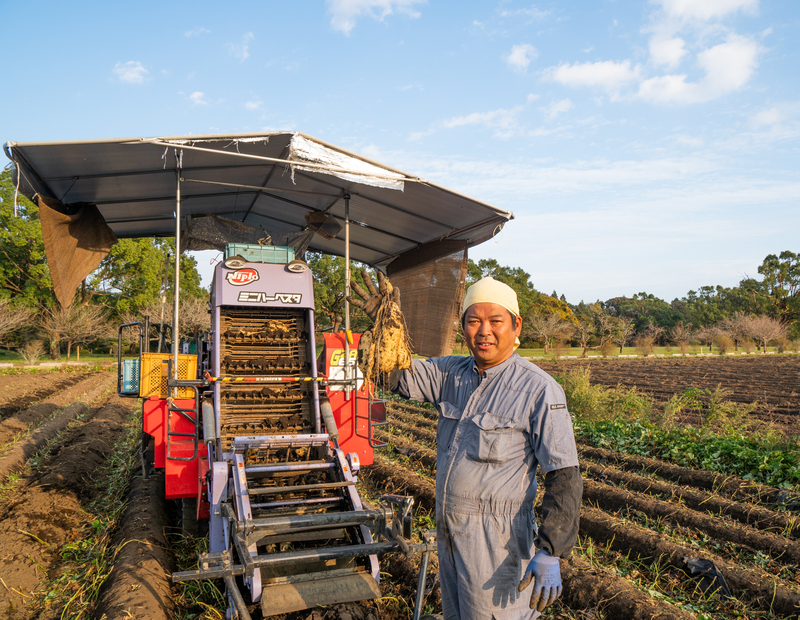 After using the machine they showed us how to handpick potatoes out of the ground, so we finally got our hands dirty. We then moved to our homestay for the night, and the family cooked us up nabe. We ate outdoors and they made us feel comfortable as guests, playing music and attempting to communicate. Nabe is not well known for people outside of Japan so it was interesting and authentic to experience it in a homestay. The stay was with a family in a village, and they were very friendly and eager to show us their life. We used their ofuro, and participated in a tea ceremony, as well as tried our hands at ikebana. We slept on thin futons on the tatami mats of the traditional house, and woke up to a breakfast made by the mother of the family. The local area tuned out to be very pretty when we went on a walking tour in the early morning, along the riverside and up to a hill viewpoint. 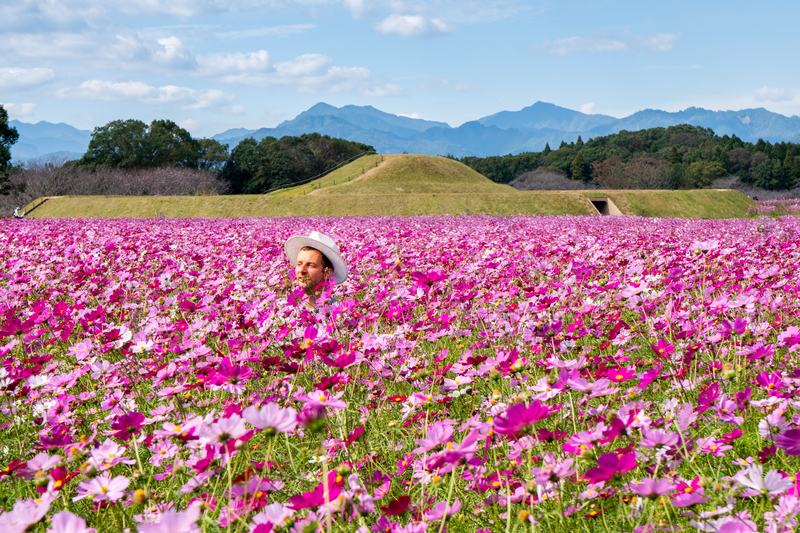 We started the second day back at Saitobaru, Many tourists love the flower fields around Japan and the one here was very colourful. We took lots of photos here and stopped several times to find new angles. There are over 300 tombs here in raised little hills, making for an intriguing landscape. Inside the tombs themselves are quite simple stone structures where people were buried. Our next stop was Ayanoteruhaotsuri Bridge. 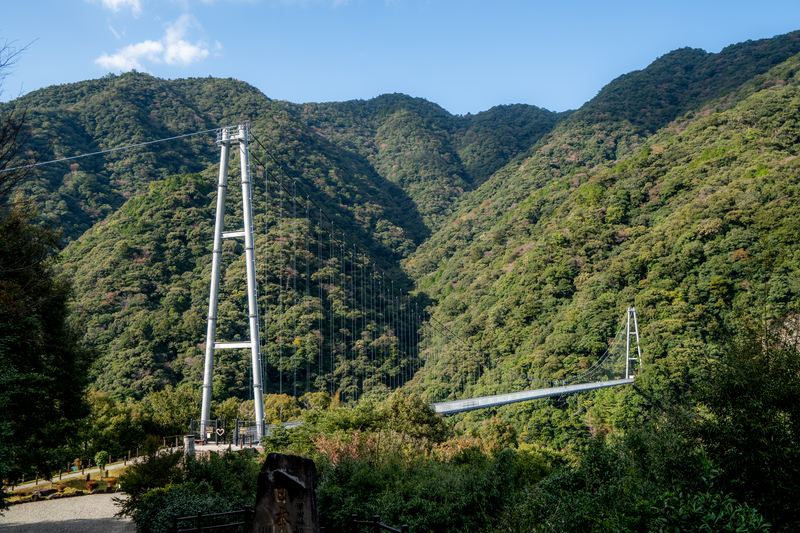 Built over a deep ravine and accessed up a steep hill by road, it is said to have been the largest of its kind until a neighboring prefecture built a bigger one. Our guide told us that it was built to increase tourism and there was a museum nearby too. The nature here is very nice, the steep cliffsides covered in foilage, and we walked across the bridge looking down at the river and could see another bridge below. We went to a waterfall but there was no water probably due to the season. That night we moved to the Sheraton Grande Ocean Resort, also known as the Phoenix Seagaia Resort. This huge resort was really very impressive and unexpected. It’s a massive hotel and yet its surrounded by a lot of greenery. The views from the high floors are spectacular, looking all along the coastline, with two golf courses amid the trees. Inside they created lots of things for people to do and we took on the challenge to make our own pottery. I had never made pottery before so this was my first chance. The potter here was very patient and happy to show us carefully what to do. We decided first what we wanted to make and them tried to recreate it, spinning the clay and moulding it while always applying water. They promised to finish creating them by adding colors and patterns and then send to us to our home addresses so hopefully mine will arrive soon! The final stop was actually the highlight of the trip, a small subtropical island called Aoshima. Inside the island is the Aoshima temple, entered via a torii gate right on the islands edge. The flora and fauna here is lush, and the natural rock formations that surround the island are in straight lines, making for an unusual landscape. The blue skies and cool breeze made it a nice place to wander around and it was easily the best place to take photos, as you can see on this page!